Ever since the cars of the Bubble Era aged into legality under America’s draconian 25 Year Import Rule, we have become open to the great mini sports cars of Japan. But which one is best? Some Canadians decided to figure it out. I took a good week to calm down, eating plain oatmeal and listening to whale song. Driving.ca was more rational, and took a good look at both of these vehicles as both joyous machines and, you know, cars that you have to live with. And that’s where the Beat and the Cappuccino differed. Both have similar specs, offering about 63 horsepower from three-cylinder engines of just under the regulated 660cc, pushing around about 1,600 pounds. Both are roadsters, both are rear-wheel drive. The main difference in layout is that the Beat is mid-engined while the Suzuki is front-engined, and the Suzuki is turbocharged while the Beat is naturally aspirated. 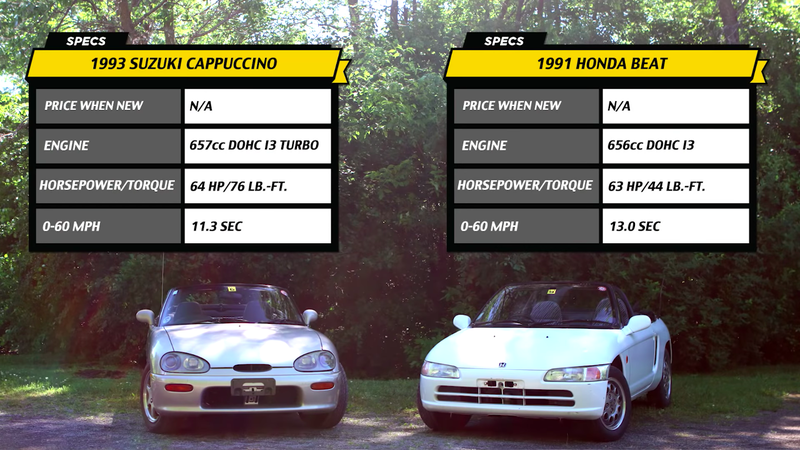 The difference is that while the Beat is just purely entertaining to drive, feeling fast and racey and very low to the ground, it’s the Cappuccino that works better as, like, a car. It’s roomier inside, it’s actually faster and it’s much more practical and usable. Read more of Driving.ca’s impressions here in a full article, and please buy all the Cappuccinos you want. My heart still lies with the Beat.